All aspects of your life are open to scrutiny when running for president, including pet care credentials. And as careful as Mitt Romney has been to construct an apple pie like family scene, his competitors want the public to know how he treats man's best friend. All aspects of your life are open to scrutiny when running for president, including pet care credentials. And as careful as Mitt Romney has been to construct an apple pie like family scene, his competitors want the public to know just how he treats man's best friend - the family dog. President Obama's reelection campaign is having a little fun with an old story about a Romney family road trip that was chronicled by The Boston Globe in 2007 when the former Massachusetts governor also ran for president but failed to capture the GOP nomination. Apparently Romney affixed a kennel to the roof of his station wagon and then installed his Irish setter into it (a dog that can weigh 70 pounds!) as the family drove from Boston to Canada. The story caused a minor uproar among animal advocates and pet lovers alike at the time, and it has resurfaced on the 2012 trail. A video montage from fellow GOP contender Newt Gingrich recalled the incident earlier this month; a Dogs Against Romney website is enjoying new popularity; and now the Obama team is getting into it. Obama campaign strategist David Axelrod tweeted a picture of President Obama transporting his dog Bo via - the inside! - of his limo. 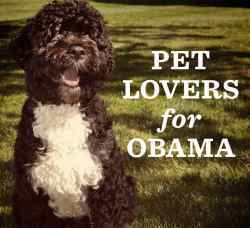 The Obama reelection campaign also created a new Facebook page: Pet Lovers for Obama, featuring the "paws, fins, and claws on the campaign trail." It is asking supporters to submit photos of their pets in campaign gear. As someone who covered the pet industry for nearly four years in a previous job, I can tell you animal lovers do not take such treatment of their pets lightly. There are nearly 50 million American households with a dog, many of whom treat them like their kids. The dog flap might not be the thing that foils the Romney campaign, but it certainly is fair fodder for debate.